This papyrus tells me a story. First, that the text is in Greek. The study of the New Testament is firmly tied to the study of ancient languages. 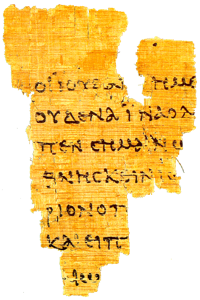 Second, that all autographs, i.e., the original texts by the hands of the authors of the New Testament texts are lost. What is left are copies of copies, a lot of copies. Third, that many of texts are in a poor state. They need to be read together, in the light of each other. One human cannot read them all, we have to read them for one another. The study of the New Testament is a social effort. Fourth, that even a tiny piece or a badly preserved fragment has its origin in a divine sphere. It is transcendental and goes beyond the human mind. These presuppositions have been in my mind during my years of studies, and in my research for the last nine years, which ended up in the thesis Crucifixion in Antiquity: An Inquiry into the Background of the New Testament Terminology of Crucifixion. It became clear to me some years into the project that the outcome might be controversial in some circles, but I could never in my life imagine that it should make headlines around the world. However, many of these articles in general and headlines in particular has been off topic. As a matter of fact, often misleading. Not least this has caused a frenzy in the blog sphere and as a result filled my mailbox. I have received numerous encouraging and supportive mails. But, also several mails from worried parish ministers as well as members of various churches. On this occasion, I decided to create this site.